Just a heads up that for a variety of reasons, we'll be off the radar and out of the loop for the next week or so. Try to enjoy your BoogieDowner-less week (if that's possible). 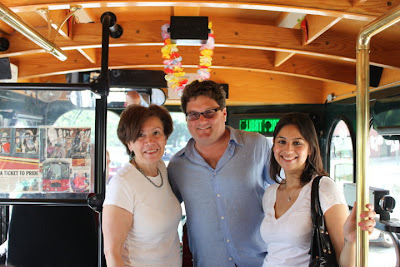 Check out the new blog, Bronx Political Chatter, from Tony Cassino. This will certainly become part of my internet loop. Best Ghanaian Grub in the Bronx? I'll be coming out to your fair city next week for the BlogHer conference, and was wondering if you have a suggestion for a great Ghanaian restaurant in The Bronx. I used to finagle business trips to New York for a chance to eat like I did when I lived in Ghana long ago, but my favorite place on Broadway and 125th in Manhattan has closed, and I heard all the good places are now in your part of town. 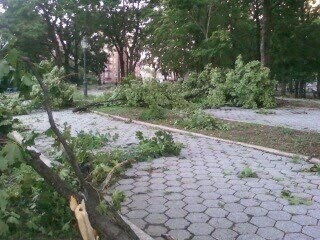 Hope all our fellow Bronxites are okay after yesterday's crazy weather! The Friends of W illiamsbridge Oval will be having a meeting on Thursday (7/22) at 7 pm at the Oval park in the picnic grove (between the bocce ball courts and the track). The only race in the NYRR Half-Marathon Series Presented by Continental Airlines that takes place on mainland USA, the "Bronx Half" is also the fourth race in the five course Half-Marathon Series. To be finalized in August - Details to come. • Thursday, August 12, 1:00-7:00 p.m.
• Friday, August 13, 1:00-7:00 p.m.
• Saturday, August 14, 11:30 a.m.-4:30 p.m.
No person shall post, display, affix, construct or carry any placard, flag, banner, sign or model or display any such item by means of aircraft, kite, balloon or other aerial device, in, on, or above the surface of any park for any purpose whatsoever without a permit issued by the Commissioner. Each separate item placed in violation of this section shall constitute a separate violation. I guess someone should ask SMP Realty if they have a permit? Not a clue where this is, but the listing photo is kind of priceless. Be sure to note the broker's prison tattoo in plain view. 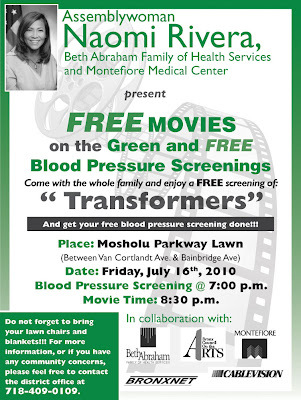 Naomi Rivera's office is sponsoring a free screening of the movie "Transformers" on the Mosholu Parkway this Friday. 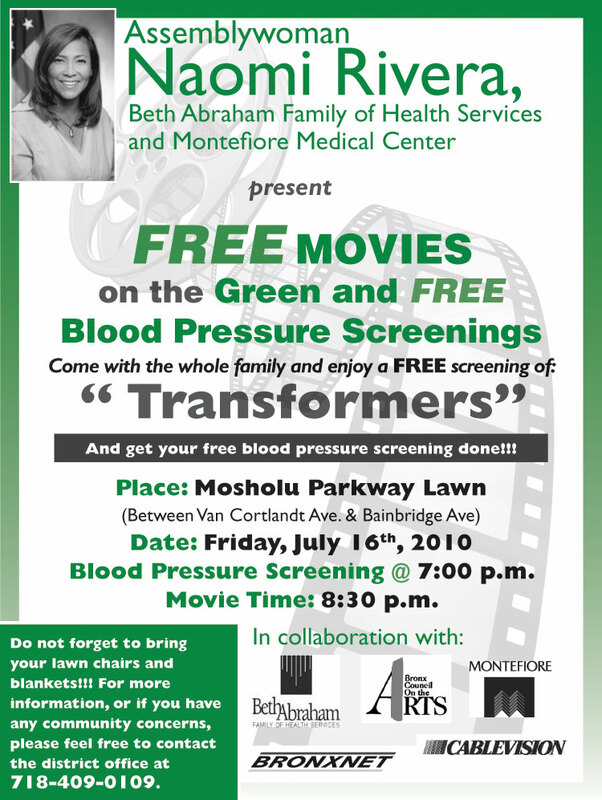 The movie, which will be shown at 8:30pm on the Mosholu parkway between Van Cortlandt and Bainbridge Avenues, will be preceded by a free blood pressure screening at 7pm. Click Here for more info, or call 719.409.0109. ...Bronx News Network is reporting that Desiree Pilgrim Hunter has pulled out of the 33rd district state senate race. Daniel Padernacht, Fernando Tirado, and Gustavo Rivera are the three candidates still trying to get on the ballot to unseat the ethical midget that is incumbent, Pedro Espada Jr.
Espada Trading Pineapples For Petition Signatures? Here are a few videos from resident political gadfly and blogger Rafael Martínez Alequín, via the Daily Politics, that allegedly show Westchester Pete giving away bags of food at Vladeck Hall in the Amalgamated Housing Cooperative on June 26. We wonder how many of the 10,000 signatures he brandished at the Bronx Board of Elections were garnered in similar fashion? Here is a radio clip of state senate candidate Fernando Tirado on the Perez Notes. Thanks to Bronx New Network for reminding us about this. Better Late than Never...Thanks Parks Department! We hope that these signs will dissuade the parkway users from making the Mosh less safe and a little dirtier with illegal grilling. Sorry it has taken so long to post something today. A newborn and a 2.5 year old complicate blogging sometimes (let's be honest, they're kicking our asses today). Fernando Tirado is holding a fundraiser tonight (it actually just started at 7pm) at the Identity Bar and Lounge in Manhattan. We'll reach out to the campaign to let you know how it went. And Westchester Pete was spotted in the Bronx. No linkage, just an eye witness sighting from the Missus, who saw Pedro rocking a dapper power suit in the lobby of our building (the same building in which he pretends to live). Just thought it was interesting to note because of the infrequency of Espada sightings in his primary residence. Labels: 33rd State Senate Race, Fernando P. Tirado, Gustavo Rivera, Pedro Espada Jr.
BoogieDowner has been semi-watching this unit for a while. We profiled it a few times when it was first listed at $265K back in May and then when it was chopped a week later down to $259K. Then a little more off the top brought it down to $254K. The chopping resumed in September and settled at $239K. This had been off my listings loop radar for a while, but it caught my eye again today with a chop all the way down to $199K. Not that anyone's counting, but that's a 25% cut in a little over a year - ouch! Maybe the $265K wasn't entirely realistic? Death of a thousand cuts is tough. If the chop had been a bit steeper, sooner, they might have sold this before the expiration of that federal tax credit. In any case, it seems like a decent deal at $199K. This is a big unit (950 square feet) at the foot of one of the prettiest parks in the City. The building looks well kept - it even has one of those fancy Co-op names ("the Van Cort" - I guess brevity is their thing). 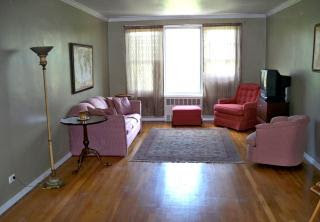 This apartment is also right near Riverdale and all of its amenities. One nice local amenity is the opening of the Bronx Ale House. There's also some shopping on Broadway. 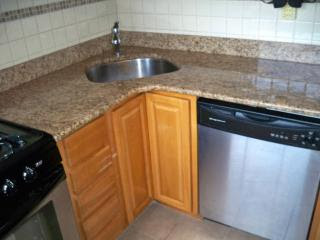 The kitchen and bathrooms look like they've been updated and the apartment doesn't appear to need that much work. All in all, this is a pretty solid apartment for a pretty decent (and falling!) price. When we were asking about the maintenance in a previous LOD profile of this unit, the listing agent actually left a few comments. Laura also clarified that the maintenance is $791/month, which is 40-50% tax deductible. The BD is no stranger to shining a light on Bronx pols behaving badly when it comes to misusing their official placards (see: Pedro Espada Jr. and Vanessa Gibson). Well, it has come to our attention that a concerned Norwood resident has declared war on the misuse and non-enforcement of parking placards in what he or she calls "the Dirty Five-Two." The anonymous poster has snapped photos of at least 14 unticketed cars misusing parking placards in Bedford Park and Norwood and has uploaded them to Uncivilservant.com, a website that follows such things. We agree with the general sentiment of the poster that these violations endanger our community. Whoever he or she is, we want to thank them for their vigilance and we want to encourage you to do the same. 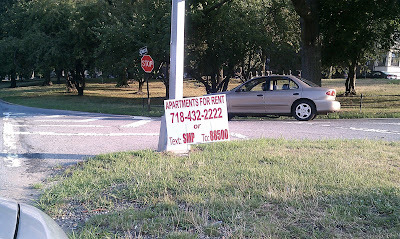 Call 311, snap photos, submit violations to uncivilservant.com and maybe we can make a dent in this problem. Here are the locations of the violations that "norwoodresident" has espied. Does anyone else feel the same way about parking enforcement in the 52nd precinct (or the whole Bronx for that matter)? A little Independence Day gift from the New York State Democratic Party for the Bronx and the 33rd state senate district. I guess Westchester Pete was one scandal over the line. The NY Post is reporting that a letter written with the the approval of Charlie King, the executive director of the state party, has been sent to Jeff Dinowitz, the Bronx Democratic chairman, asking that the legal proceedings for political ouster begin. No need to recount all the scandals here, but we all know why the state party wouldn't want this lout in its fold. (Although we're still not clear on why it took so long for the state Dems to grow a pair). 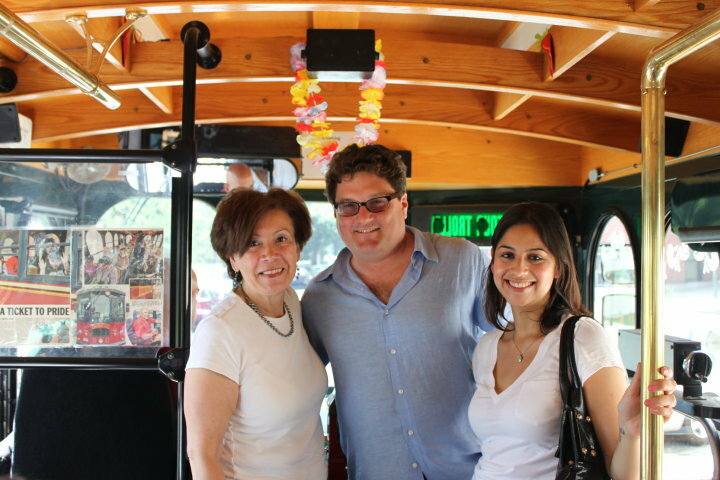 On a blistering hot Saturday (6/26), another Bronx real estate trolley tour went off with a standing room only crew of apartment hunters from all over the city. Associate Broker Greg Tsougranis led the tour and showed the crowd of about 40 potential buyers a bevy of beautiful buildings on Mosholu Parkway and the northern reaches of the Grand Concourse. Even Marlene Cintron, the President of the Bronx Overall Economic Development Corporation, was there to lend support to this potential infusion of real estate dollars being spent in the Bronx. Here's hoping someone found their next home!